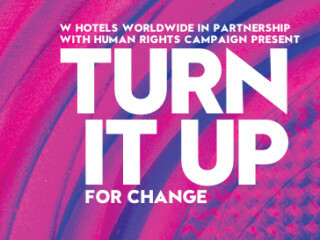 The W Austin joins W Hotels around the nation to amplify awareness and support for marriage equality in all 50 States with Turn It Up For Change. The monthly event will take place in W Austin's Living Room Bars with a portion of sales benefiting longtime partner, the Austin Chapter of Human Rights Campaign (HRC) and their collective "Fight For 50" marriage equality initiative. All guests attending Turn It Up For Change events will not only have be supporting the fight for marriage equality, but will also have access to late night happy hour pricing on the acclaimed bars' signature libations and nibbles food menu.